The following are some excerpts from my journal that give an idea of what living in our new home was like during the first week. This article is long, so if you don’t want to read it all, that’s perfectly understandable. (You might want to search on “puppy” or “Canela”, though.) Also, "home tour" videos are provided at the end if you're interested. The workers were supposed to show up at 7:00 a.m., so Marilyn and I got up at 5:30 a.m. We got dressed, though it was a little complicated. The sink in our bathroom worked, but not the toilet. The toilet in Isabel and Victoria’s bathroom (the other bathroom near our room) worked, but not the sink. It would have been more complicated if Victoria and Isabel hadn’t slept upstairs. There was nothing to eat in the house, so we all had some hot tea. Sure enough, the workers started coming at 7:00 a.m., or thereabouts. Today they were mainly working on the cocina (kitchen) and widening the walkway in the back for me. They also started my ramp at the back door and painted Isabel and Victoria’s room some more. Oh, yes. We also got a working toilet in our bathroom! Today we paid for a new hot water heater. It kind of made me angry because they didn’t consult us before replacing it. Luckily, we had priced them previously and knew that we were not overcharged. After Marilyn and Isabel had gone to the grocery, we had a more normal breakfast of eggs, pan (bread), avena (oatmeal), coffee, and hot chocolate. During the morning, Marilyn and Isabel worked on trying to put some order into the house. Elvis worked on fixing up his room upstairs. Isabel didn’t send eight-year-old Brayan to school today because they couldn’t find his school uniform, so he mostly had fun. I worked at the computer. For lunch, we went to Luz and Cesar’s restaurant (Cesar is one of Isabel’s brothers and Luz is his wife), which Marilyn and I hadn’t known about, because our cocina is not working yet. Their restaurant is at the bus terminal, so they catch a lot of travelers. It’s a pretty valuable spot. Luz works at the restaurant and Cesar works at a small ferreteria (hardware store) they own. 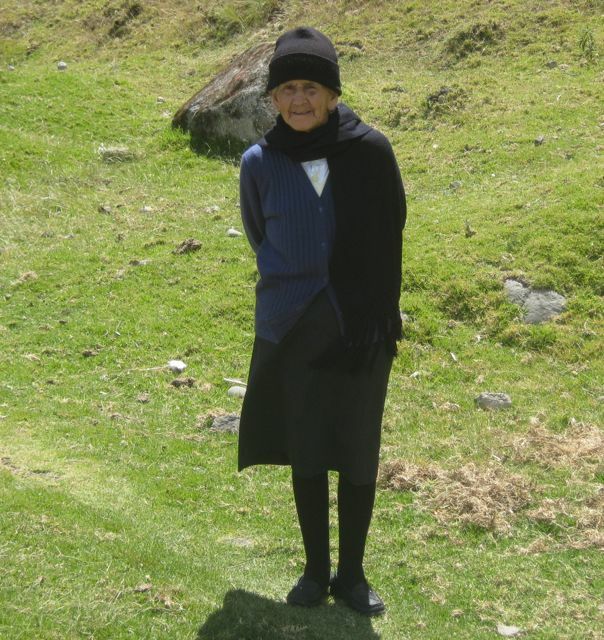 At first, Luz said, “No hay comida,” (“There is no more food,”) but she was joking. The six of us had no sooner sat down at the outdoor restaurant than our plate lunches were served. They call it fast food, but that’s only because it’s always ready since only one dish is offered each day. Our “fast food” consisted of rice, potatoes, salad, avocado, and hamburger meat. Oh, and a mug of juice. After the meal, Marilyn asked Isabel how much it cost and she said, “No sé.” (“I don’t know.”) The next time Luz came out, Marilyn asked her. “Cien mil dolares,” (“One hundred thousand dollars,”) Luz said. The six of us ate free. She had probably heard from Isabel that our cocina wasn’t working yet. That’s how generous many people are here. Brayan went to school today. Isabel has arranged a ride for him. They pretty much finished with the kitchen so we can use that now. Every room downstairs has work left, some more than others. We were able to start moving things into the comedor (dining room). They painted the study, so I read all day rather than tried to work. My ramp at the back was also finished. Marilyn pushed me right out there, but I left tracks because it wasn’t quite dry. I told Marilyn we should all write our names in the concrete, but she wouldn’t hear of it. At least, I got my "signature" in it. We bought two chests of drawers today, so now we can put away our stuff. Daniela wanted $800 of the $1,825 we still owe her to pay the workers. She said the bathroom doors we want would cost $200 each and wouldn’t be ready for fifteen days. Isabel talked them down to $140 each, but it’ll still take fifteen days (NOTE: We actually got them in nine days.). It’s good to have someone around who knows what things should cost. Every time Isabel goes to the mercado (market) with me she bargains much lower than I would, or even could. Here, there’s often a higher price charged to foreigners than to natives. The workers pretty much finished with the inside remodeling yesterday, so the unpacking process should go faster. They’re still working on our bathroom, though, and neither our bathroom nor Isabel and Victoria’s bathroom has a door. 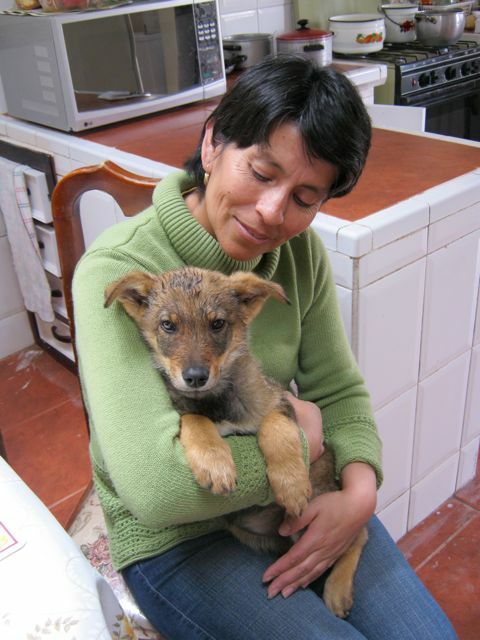 Marilyn brought home a puppy, about six months old, from Caluquí this morning that was given to her. She’s cute. We were going to let Brayan name her, but Isabel liked the name Canela and Brayan agreed. So, Canela (cinnamon) became her name because of her color. She was pretty traumatized by the car ride and then the bath Marilyn gave her, so she curled up by my feet and stayed with me in the study all afternoon. Yolanda, Isabel’s sister, and Margola, a sister-in-law, came over. They, especially Margola, sat and talked for most of the afternoon. They also asked us to buy them shoes (with their money) when we go back to the States. We will if it doesn’t create too much of a space problem. The workers finished painting the outside of the house today. On Monday, they’ll come back and finish painting the central courtyard, as well as repaint our bathroom. They sanded down some old artwork on our bathroom walls today that made the first paint job lumpy. The maestro (tradesman) who will make our bathroom doors came over today to measure. We gave him half the money today and will fork over the other half when the doors arrive. Daniela, the arquitecta, called wanting the rest of her money and Isabel reminded her that the contract said we’d make the final payment at the completion of the job. It should be completed on Monday or Tuesday (except for the bathroom doors, which are separate). Auri, a very good friend of Isabel’s and now a hiking buddy of Marilyn's, came over for a visit. Again, we sat and talked for a pretty long while. Lucila and Natasha came over this morning not long after breakfast. Natasha is our ajihada (goddaughter). Elias, Lucila’s husband, grows strawberries, and they brought an overfilled bucket to us. Isabel says it’s traditional to give the “first fruits” of a harvest to padrinos (godparents). We talked FEDICE business for a while. Marilyn asked Isabel to relate what Lucila had told us this morning about the new foundation that’s providing food for the children and salaries for the employees at the daycare center because Marilyn didn’t think she would translate it correctly. The new foundation is giving the children less and poorer quality food, restricting the children who can eat it, paying the teachers and cook less, and requiring more reports. Also, Isabel said that if one receipt in a submitted batch is found to be bad, then they are not reimbursed for the entire batch. We’ve learned that a “foundation” here is actually a part of the government, not independent like in the U. S.
The day was bright and sunny, so we went outside. Elvis had laid out a volleyball court in the backyard, so he, Blanca, Luis, Brayan, and Marilyn played. I kept score. Canela was the mascot, sometimes getting in the way and being dragged off the court. Isabel, Victoria, and Brayan went to mass at Brayan’s school this morning. When they got back, Marilyn was making pancakes and Elvis was up. We all sat down and had some great pancakes. Marilyn had even picked (illegally) figs from a neighbor’s tree and made jam from them that was really excellent. Luz, Cesar, and Maria Augusta came over for almuerzo (lunch) and brought Romeo, their puppy, so he could get to know Canela. The dogs got along alright, but didn’t really play together. Marilyn made roasted tomatoes, chickpeas, and spaghetti for lunch. We also had strawberries and cream, as well as a sort of apple crisp with oatmeal and raisins. It was different fare for most people, but there were few dirty plates afterward. After lunch, Cesar thanked us for deciding to live with Isabel’s family. He called Marilyn an angelita and me an angelito. Marilyn assured him that Victoria, Isabel, Elvis, and Brayan were also gifts to us from God. She’s right about that. We sat in the sala (living room) after almuerzo for conversation and visiting. It was the first time we had had a chance to use the furniture Alfredo (Isabel's eldest brother) had given to her. Before Cesar and family left, we lit a fire in the fireplace for the first time. I remarked to Marilyn that now we would find out about other problems with the house. We kept the fire going after Cesar and family left. The fireplace opens both to the sala and the comedor (dining room). We were pleased with the amount of heat radiated into the sala. Since 1) the electricity was still out, 2) we were full and warm, and 3) we didn’t have anything pressing to do, we were content to stay by the fire, talk with each other, and pet or play with Canela. At one point, Elvis commented, “Un momento de familia.” (“A family moment.”) He was so right. They consider us family members, and we consider them family members. Later, we discovered one problem with the fireplace. Where it opened to the comedor, soot stained the wall. Oh, well, I guess we’ll just have to live with that problem. The paint is not very durable here, so scrubbing it is not a viable option. By 7:00 p.m., we had lit a candle because it was getting dark. I had given up on the electricity coming back on and was even thinking of going to bed. Flash! The lights came back on. Elvis jumped up and pushed me to the study where we could watch the Super Bowl on DirecTV. It was fun to watch it with Elvis and explain some of the rules to him. I even pulled for the right team. Go Packers! And so, though chaotic, the first week in our Ecuadorian home came to a happy end. Daniela, our arquitecta, called this morning and said it was not possible to move into the house today. It would have been possible for us to stay at the hotel a few more days, but Isabel’s lease was up the next day. Besides, all the help had already been arranged. Marilyn called back and said we were moving. We needed both downstairs bedrooms and one downstairs bathroom to be livable. It would be good if the kitchen worked also. Yolanda, wife of the hotel manager, said goodbye to us at breakfast and that she’d miss us. We thanked her for all the help she and Don Jairo, the hotel manager, had given us during our eleven-month stay, and for taking us along on the trip to Intag. Benicio, Carmela, Rosario, and Eddy also said goodbye. Benicio said that it was bad that we were leaving. Marilyn joked that they’d be getting less money, but I think he was trying to say that he would miss us, too, or maybe the hotel wouldn’t be quite the same without us. At 11:00 a.m., Marilyn and Isabel went over to clean the house, primarily the bedrooms. They would clean the kitchen, too, if they had time. 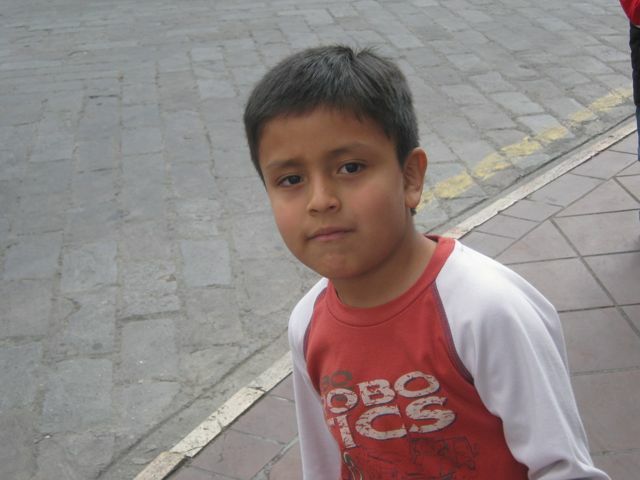 Tocayo, his son, and Pilar’s sons came to the hotel a little after 2:00 p.m. with a truck. It didn’t take them long to collect what we had. The truck seemed so big that I figured it would only take two trips to get everything Isabel had. We decided I would stay at the hotel and read on the veranda until Marilyn got our stuff moved in. It was a beautiful day and I could enjoy the view of the hotel grounds one more time. Marilyn put things in the car that she didn’t want put in the truck. Marcello, Viviana, and David showed up to help just as the truck was finished being loaded. They rode to the new house on the truck. It was great fun for 5-year-old David. While everyone was gone, I had a chance to push all around downstairs. A lot was left to do, but the house was livable. It’s just that it wouldn’t be a lot of fun living in it while the workers finished up. What had been done so far looked like good quality work. I ended my ramblings on the front porch looking at the front yard and Imbabura. I guess I was surveying my domain. I saw the humming bird I had seen when I had been to the house before. There are many plants in the front yard that it likes, but one in particular. I also saw doves and sparrows flying about. I think the variety of birds will be greater here than at the Ally Micuy Hacienda. I’ve seen flocks of water birds passing here before. When the movers got back, I moved into the office to stay out of the way. Three of Elvis’ friends were helping at that point. I watched them bring in piece after piece of furniture. Most of it went upstairs. When they left for more, I went back to my perch on the porch. All in all, they made five trips to Isabel’s to get the family’s stuff, and finished way after dark. I was way off in my estimate of how long it would take. I couldn’t believe how many things had been crammed into Isabel’s apartment. But, then, some of the chaos was do to the fact that we couldn’t put some furniture into the room in which it belonged because some rooms were not ready yet. We decided to have pizza for dinner. I’ll bet thousands of people who move to different houses have that same First Supper. When Marilyn went to get the pizza, she dropped Elvis and his buddies downtown. Brayan went with them. He didn’t like the idea of pizza anyhow – Brayan doesn’t like cheese. So Isabel, Victoria, Marilyn, and I had the pizza all to ourselves, and it was good. After we ate, we started thinking about bed, as it was after 9:00 p.m. Isabel and Marilyn found the pieces of our bed and started putting it together. The boys were still not home, so Isabel called and told (asked?) them to come back and help. They must have been on their way, for they got here within a few minutes and Elvis helped finish putting the beds together. Isabel and Victoria’s room was not painted yet, so they slept upstairs with Brayan in his bedroom – fortunately there was enough room for two double beds. We found Marilyn’s pajamas and some toiletries and were able to go to bed ourselves. We were both tired, but neither of us could get to sleep for a while. Maybe it was the excitement of finally being in our own house in Ecuador. I could see out of a crack at the side of the curtain. It was cloudy, with the light of Otavalo illuminating the low clouds. There was also a tall eucalyptus tree not too far off. It wasn’t until we switched sides that we were able to fall soundly asleep. 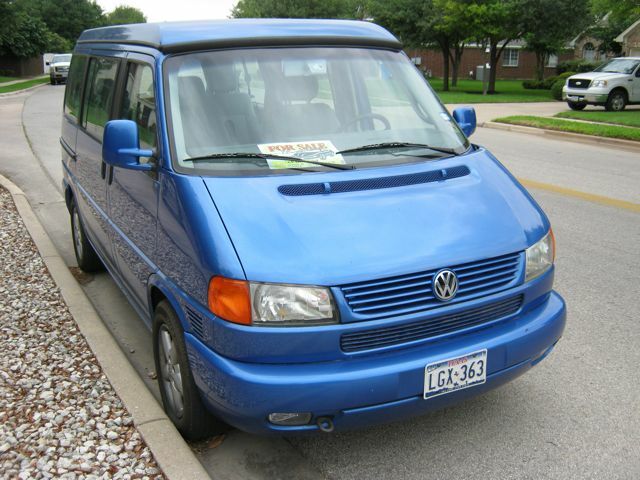 of this great VW Eurovan! 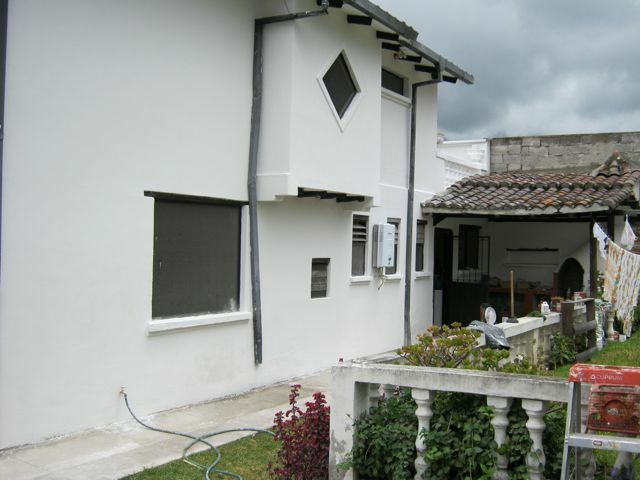 We had found the house we wanted in Ecuador and now it was time to take care of some minor details before actually buying it, such as arranging to sell our Pflugerville home; store, give away, or sell its remaining contents; and sell our car. We went to the U. S. in November for a visit and found that our first task, selling the Pflugerville house, would be easy. Darrell and Linda Laurence, who had been living in our house while we went off to Ecuador for what we had expected to be a year, fell in love with our house. If we wanted to sell it, they would buy it. It would be a win for both of us, because we wouldn’t have to go through a real estate broker. We decided to do the deal when we returned for another stateside visit in February. We’re not too shy about getting rid of possessions, and we decided we’d also do that in February. The few things of sentimental value that we’d like to keep could be stored at my brother’s or in the house where they are currently located. Both David and Lynn, and Linda and Darrell, were kind enough to offer that storage to us. 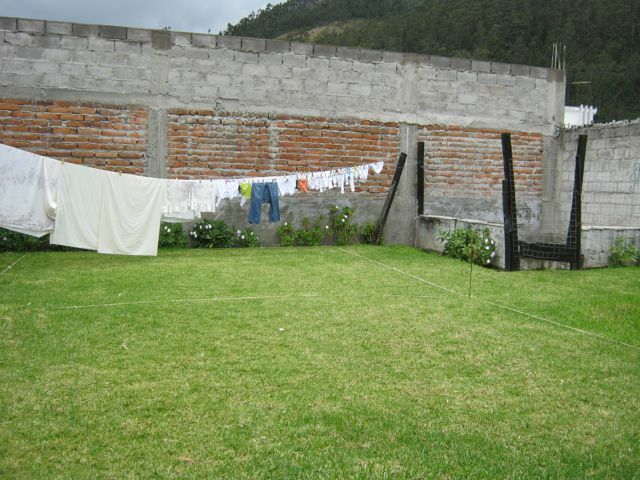 When we got back to Ecuador, we started working on the house immediately. We had an architect do an inspection, and the house passed. However, the inspection was no good because the architect we chose was a friend of Tatiana’s, the owner of the house. The lawyer we subsequently hired to help us through the process said that he would take care of the inspection (he never did). I think he was also a friend of Tatiana’s, or at least her divorced husband. It’s hard not to know everyone in a town of 50,000 people, especially if you’re in the professional class. We started the buying process in earnest December 1st, hoping to be in the house before Christmas. That hope was soon extinguished. Tatiana and her ex-husband got into a disagreement at the first meeting about who owned what. More than that, however, the bureaucracy is very slow. What with the long Christmas holidays upcoming, we couldn’t get a closing date before January 14th. At the second meeting the next day we wrote Tatiana a check for $4,000 (to be deducted from the selling price) so she could satisfy a bank lien. That wasn’t what bothered me most, however. That same day Marilyn had to sign a compraventa, a contract to buy. Instead of the 10% back out penalty I had expected, the penalty was $30,000. It applied to both parties, but we knew Tatiana was all but broke. (Otherwise, she wouldn’t have needed our $4,000.) Therefore, if we had had to back out for any reason, we’d be on the hook for $30,000. However, if the owner backed out, it was unlikely we’d see any of that penalty money. We had a chance to discuss it beforehand and decided to go ahead with the process. There were not too many times we had a chance to discuss things before Marilyn had to sign on the dotted line. This was because the places for meetings were almost always upstairs. You could say Marilyn went through this process alone. It was stressful on her trying to understand everything, much more so because it was in Spanish "legalese". On January 3rd, Tatiana gave us the keys to the house, though we wouldn’t close until the 14th. She had already moved out and we could start the renovations. On January 7th, a week before the closing, Blanca and Sebastian, whom we work with, had offered to do a minga to get our house painted. A minga is what they call it here when a group of people get together to work on a project for the common good. I didn’t know if painting our house would be for “common good”, but we appreciated the offer. We also knew that they wanted to help because they appreciated Marilyn’s volunteer efforts. We arranged for Sebastion to visit the house the next day so he could determine the scope of the project. We had hired an architect to determine what needed to be done to renovate the house according to our wishes. After Isabel got off work, we went to see what her findings were. She found a lot more things than we had seen. We had broken things down into two projects. The presupuesta (budget) for the first came to about $5,300. We would get the presupuesta for the next project the next day. Seeing how complicated the job was, we decided it would be better to have professional laborers who could work everyday do it so we could move in as soon as possible. As much as we had liked the idea and appreciated the offer, we called Sebastion that night and canceled the minga. Some of our friends who had found out that we were buying a house in Ecuador called us brave. To an extent, that may be true. Ecuador is not exactly a magnet for investment. Things could go wrong. But it may be truer to say that we’re a little stubborn. We tend to identify things we want to happen in our lives and then go about finding ways to make them reality. If we hit roadblocks, we often find ways around them. Ecuador has more roadblocks then you can shake a stick at. On January 9th, we went to Isabel’s for Elvis’s cumpleaños (birthday) and had cake, hors d’oeuvres, hot chocolate, and tea. We looked at things to move and thought about where they might go. They also showed us the bed Isabel is letting us use and it looked like it would work fine. Victoria wanted to know if there was a possibility that we’d get mad at the family and tell them they had to leave. That possibility may have crossed all of Isabel’s family members’ minds, but Victoria was the first person brave enough to voice it. We all agreed to have weekly meetings so we could keep lines of communication open and nip any problems in the bud. On the 10th, the arquitecta called while we were eating breakfast at 9:00 a.m. and asked why Marilyn was not at the house to open it for the workers. We both knew that she had said 10:00 a.m., but, oh well. Marilyn got over there as quickly as possible and stayed until the contractor the arquitecta had hired went over everything. She learned he would do more than anticipated, like caulk the windows and fix an additional leak the arquitecta had found. We were thinking about installing an electric fence around the property but decided it wouldn’t be worth the danger. Motion detectors would be set off by birds and things, so we decided to go with just the perimeter walls already there. The windows all have grill work on them and the outside doors have multiple locks. They take their security seriously down here. Yet, it would be child’s play to break into any of the rooms at the hotel where we are staying. Go figure. On the 11th, we closed, three days ahead of schedule. It was one hectic day. At 8:45 a.m., Marilyn picked up Isabel. Then they went to the office of our abogado (lawyer). Then they went to the bank to get some cash. Then they went to the municipio (city offices) to register some papers. Then they picked me up and we went to the casa (house). Then we went to Ibarra to buy light fixtures. Then we had lunch at Isabel’s. Then Marilyn and Isabel went to the bienes raices (real estate agency) to close on the house. Then Marilyn went to her English class in Cachimuel. Whew! That was a tight schedule, especially for Ecuador - land of mañana. There was a lot of work left to do before we moved in on January 30th. In fact, we lived in a construction zone for a week and a half after the move. But, we were happy. After six or seven months of living in a hotel, we began to get tired of eating the same meals week after week. True, we could have eaten out more, but there were two reasons why we hesitated to do that. First, our stomachs (especially mine) were still not acclimated to a lot of foods in Ecuador. The foods many Ecuadorians enjoyed sometimes caused us distress. The main reason for this was that the water used to prepare foods could not always be depended upon to be pure. The second reason we didn’t eat out much was because we both could be called frugal (a polite word for ”tight”). We were paying the hotel for three meals a day. Why should we spend extra money eating out? Marilyn also liked to cook. She hadn’t been able to do that since we’d been here and missed it. We had begun taking walks in a nearby neighborhood by this time. It had been about three quarters built out, so there were many lots still available. Every time we’d walk by one that had a decent view of Imbabura, my favorite volcano around here, I’d say, “We could build a house here.” In the beginning, Marilyn was totally opposed to that idea. However, as we began to think more and more about staying here for multiple years instead of just one, she became more enthusiastic about looking at possible lots. We decided that, if we moved to a house, we would rather live with an Ecuadorian family than by ourselves. The situation at the hotel had been good because we were both forced to talk to Spanish-speaking people everyday. We wanted that to continue. 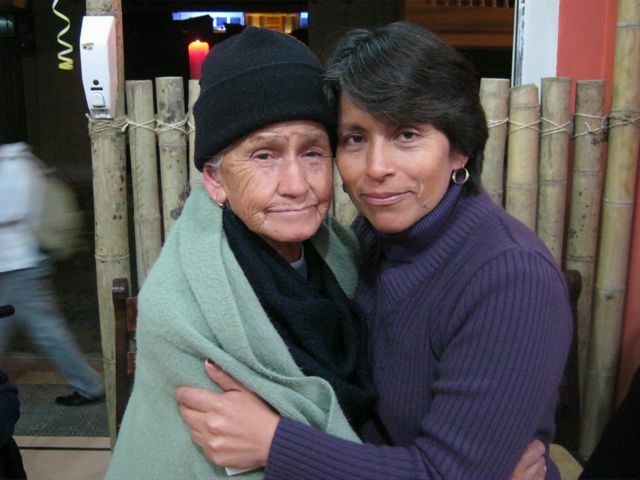 Plus, an Ecuadorian family could help us better navigate Ecuadorian culture and law. 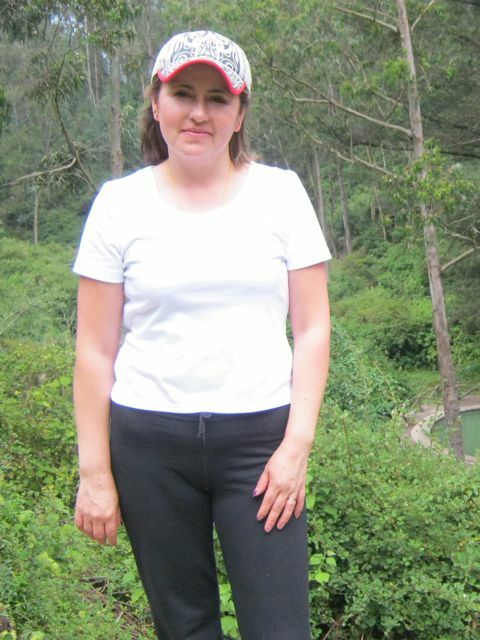 We had become very good friends with Isabel, the hotel’s receptionist (really assistant manager), and her family. So we decided to approach them first. If we lived with them, it would mean that we would need at least two bedrooms downstairs – something hard to find in Otavalo. I suggested one day that we find something appropriate that we could build or buy before we asked them. Marilyn agreed, but then she broached the subject with Isabel the same day. Isabel loved the idea. They would get to live with us rent-free, her 86-year-old mother would have more freedom because she wouldn’t have to climb steps anymore, and someone would be with her mother practically all the time. Plus, if she could quit the hotel in the future, she could spend more time with her family. The secret that we were looking at land soon got out around the hotel. In September, the owner of the hotel who lives in California was here for an extended period of time to take care of some business. When she heard we were looking at land, she said she knew of something out in the country she could show us. We weren’t really interested in living outside the city, but agreed to go out of politeness. The land in question was really a good bit of acreage adjacent to a farm. 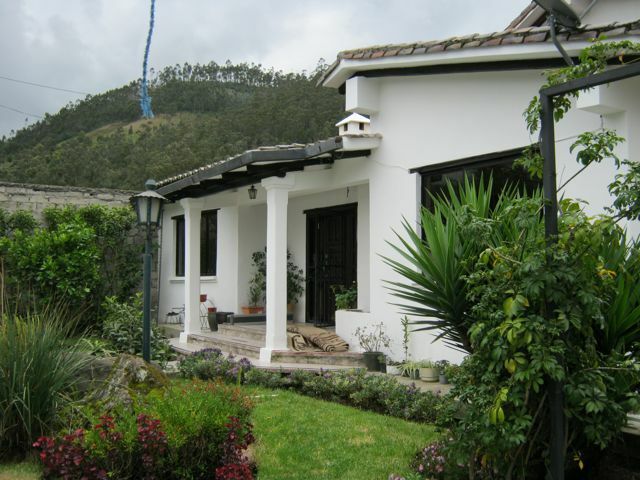 It had three houses and an orchard on it and was really pretty, despite not having a view of Imbabura. If we had wanted to live in the country, it would have been ideal except for the houses, which needed a lot of work. The man who tends the farm next door (and is a friend of the hotel owner) said he would rent the orchard from us (which is probably why we were shown the property in the first place). The hotel owner also took us to another hotel near the property we looked at and showed us the accommodations there. This seemed pretty strange to us. Why would she be showing us another hotel? If we moved there, it would be like taking bread out of her mouth. Could it be that we caused too much work for the staff? I doubted it, because the hotel staff hardly ever showed an averseness to hard work. Besides, they had always been very warm towards us. Could it simply have been that the hotel owner was merely being hospitable and trying to help us find what she thought we wanted? 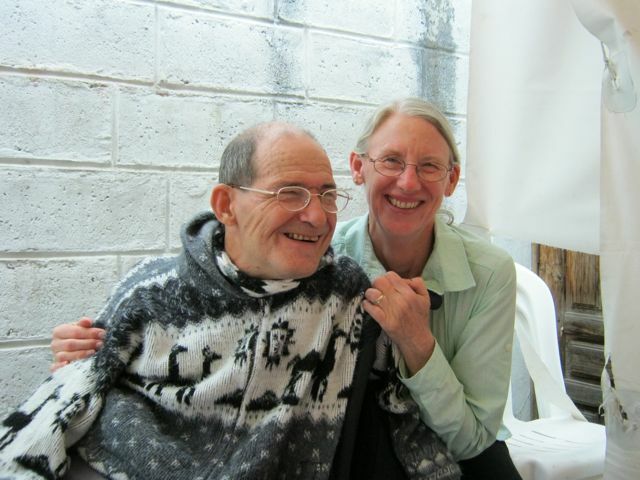 We decided that we would stay an additional five years in Ecuador provided we could find a suitable place to live. But first we needed to find out how our closest relatives felt about that, so we emailed them. They were okay with it, especially when we told them that, because of the lower cost of living, we could afford to visit three times a year. We could also get to the States on short notice in case of emergency. Emotionally, Marilyn’s mom felt that we’d be living too far away, but logically she knew that we really wouldn’t see her any less than we had seen her when we lived in Texas. 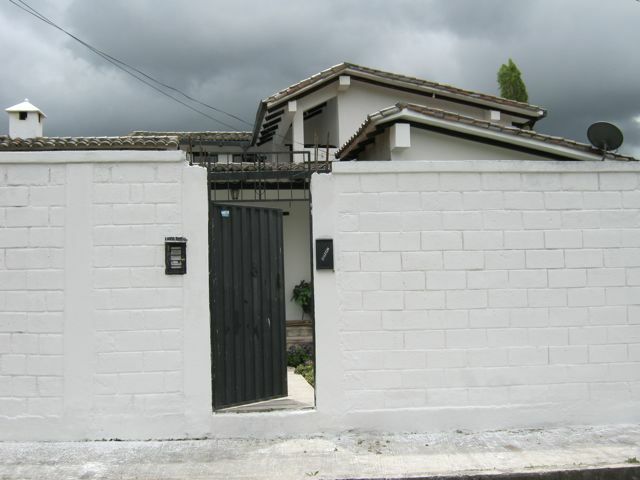 Most of the properties in Ecuadorian cities have peripheral walls around them, even when there are no houses. When a property is for sale, the number to call is usually spray painted on these walls. One day we called the number advertised for a lot we liked. It was the number for a real estate agency. They said that lot was sold, but arranged to take Marilyn to look at some houses. We had heretofore only looked at lots, with the intention of building what we needed, but why not get an idea of what things cost? Marilyn was taken to three houses and one lot. Only one house was close to being appropriate. But she didn’t get to that house until after dark, so it was difficult to determine if it really did meet our needs. After looking at other properties with a different agency and finding nothing appropriate, Marilyn made an appointment to look at this last house again, this time with me and Isabel, and in the daylight. I liked it almost immediately. It had a Spanish style of architecture with a tiled roof instead of the boxy look of most homes being built in Otavalo today. 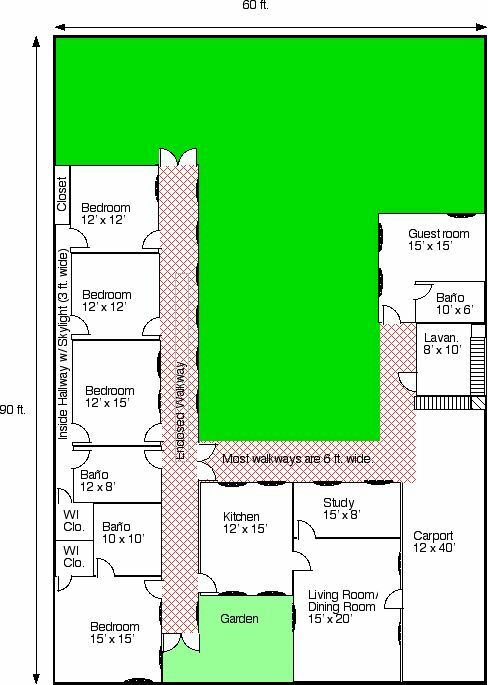 It had four bedrooms, two downstairs (required). It had a yard (required). It had a good view of Imbabura from the study (required). It had a large yard for growing things and playing ball (required). It had a bottom floor that was all on one level (required – many houses here are split level). It had a place where Victoria could raise chickens (desired). It wasn’t too far to walk to downtown – if you like to walk like Marilyn does (desired). It was affordable (required). I decided that if we didn’t find anything better, this house might be a good bet. This was my fanciest plan. We continued to look, being open to building, buying, or renting. In fact, every time we saw a lot that we liked, I’d go back to the hotel and design a house to fit that lot. The second agency with which we worked put us in touch with a U.S. citizen who kind of worked with them. He was kind of a strange duck from New York and, I believe, somewhere in the Midwest. He did things to make money like take groups of people to look at houses or drop off and pick up people at the Quito airport. 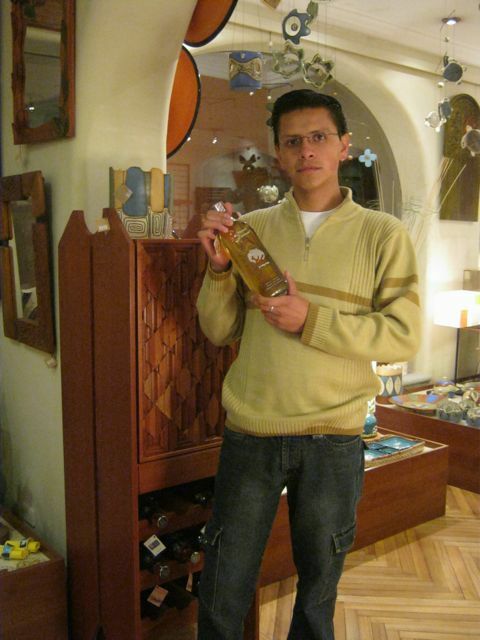 He, like so many others, tried to steer us to an ex-patriot community in Cotacachi. We told him, as we had told others, that we would have stayed home if we wanted to live among U.S. citizens. Last, we talked with Isabel again to make sure that she and her family really wanted to move in with us. Then we told the owner of the house we liked that we would buy it after we went back to the U.S. in November and wired money down here. She said that someone else was interested, also a U.S. citizen. We simply said, "Fine. If it’s available in November we’ll make an offer." It was available in November. (She’d overplayed her hand when she’d said the other interested party was from the U.S. The chances of that were very slim, so I wasn’t really worried about someone “beating us out”.) In November, she was willing to take $5,000 off the price, and we struck a bargain.